Molds on Food: Are They Dangerous? Duck Feet from our USDA All Natural Pekin Ducks. A classic dish served in Oriental dim sum tea houses. Duck Feet There are 4 products. Duck Feet - Fresh - 2 lbs. Small pack of Duck Feet harvested from our USDA All-Natural Pekin Ducks. Shipped fresh on the day of harvest with a net weight of at least 2 pounds. Duck Feet - Fresh - 5 lbs. 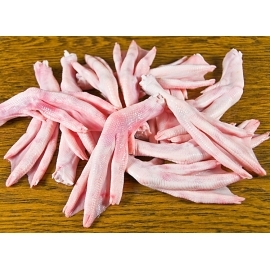 A 5-pound pack of Duck Feet harvested from our USDA All-Natural Pekin Ducks. Shipped fresh with a net weight of at least 5 pounds. Duck Feet - Fresh - 10 lbs. This is a bag of fresh Duck Feet harvested from our USDA All-Natural Pekin Ducks. The net weight is approximately 10 pounds. Shipped fresh on the day of harvest. Duck Feet - Fresh - 40 lbs. A full case of fresh Duck Feet harvested from our USDA All-Natural Pekin Ducks. The net weight is at least 40 pounds. Shipped fresh on the day of harvest.